Pelenna Patchworks: Makower Locally Grown and EQS Tonal Vineyard ranges now available! Makower Locally Grown and EQS Tonal Vineyard ranges now available! As promised, we now have a range of colours available in standard width (42" approx.) 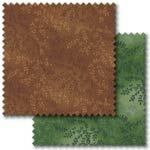 Tonal Vineyard design. Perfect for blenders and backgrounds, the fabrics have a delicate, leafy design in tone on tone colours, and are cost effective at just £8.00 per metre! 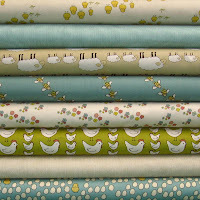 Another new collection added today is the Makower Locally Grown patchwork fabric range - ideal for the modern nursery, this set of prints feature cute animals including sheep, chicks and hens, and come in neutral colours of taupe, cream and aqua. Suitable for boys or girls, you can create gorgeous accessories for a calming, peaceful room that still has a lot of charm and interest for the little ones! The range is also available in a stash pack or discounted fat quarter pack.